This is another of the movies the Lumière brothers showed at the world’s first public film screening, at the Salon Indien, Grand Café, 14 Boulevard des Capuchins, Paris on December 28, 1895, beating Edison by about four months. 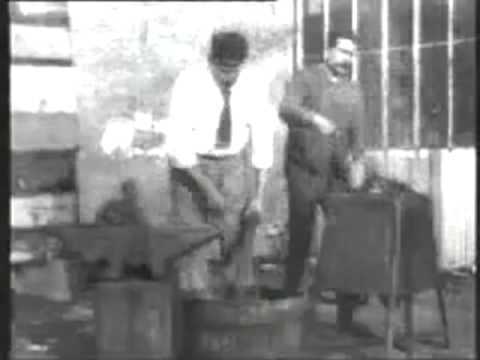 Whereas I’ve emphasized the difference in style between Lumière and Edison in the past, this one seems to emphasize that the Lumières had seen a demonstration of the early Kinetoscope, because it seems to be a French remake of the “Blacksmithing Scene.” This impression is particularly strengthened by the fact that both films end as a character offers a drink to one of the workers – in the American movie, a bottle of beer, in the French, a glass of wine. The other major difference is that where Edison’s people made an incomplete set and shot inside the Black Maria, Louis Lumière appears to have taken the Cinématograph on location or at least done a rather more convincing job of building a blacksmith set. Because of the importance of horses for transportation in the late nineteenth century, there were of course still blacksmiths around to be photographed.